'The Eddie Mabo Stamps' by his grand-daughter Boneta-Marie Mabo. Sydney artist Boneta-Marie Mabo has been voted the People’s Choice Award winner at the end of this year’s 31st Telstra National Aboriginal & Torres Strait Islander Art Award. Museum and Art Gallery of the Northern Territory (MAGNT) Director Pierre Arpin said “The Eddie Mabo Stamps was one of 65 works featured as part of the Award which has so far attracted an audience of more than 63,000 visitors since the exhibition opened in August. 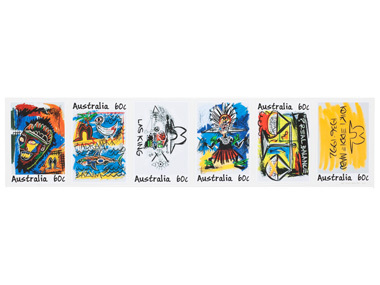 Boneta-Marie's own comment on her work was: “In 2013 my Grandfather, Eddie ‘Koiki’ Mabo was featured on a stamp along with Shirley Smith, Neville Bonner, Oodgeroo Noonuccal and Charles Perkins. This was in honour of his significant contributions and tireless campaigning for the rights of my people. To honour my grandfather for the personal impact he had on my life, I wanted to create my own stamps. The stamps are cut and mounted on a strip of backing paper to replicate an oversize stamp roll. The show is now over for another year, but let's not forget that Queensland artist Tony Albert won the $50,000 Telstra Art Award in August for his photographic entry We Can Be Heroes. The Telstra General Painting Award was awarded to West Australian artist Daniel Walbdi for his work Wirnpa and Sons 2014 that depicts the jila (living water) of his ancestor’s country, which is one of the most significant places for many of the tribes in the Great Sandy Desert. 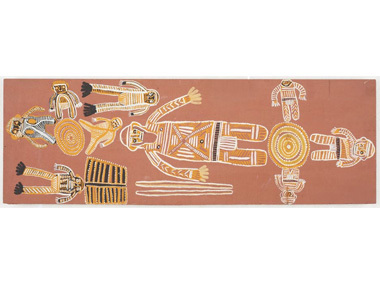 The Telstra Bark Painting Award was awarded to Northern Territory artist Garawan Wanambi for his work Marrangu, which depicts country close to Raymangirr, on the coast of Arnhem Bay. The Telstra Work on Paper was awarded to South Australian artist Nici Cumpston for her work Scar Tree, Barkindji Country, which is taken from Ms Cumpston’s having-been-there series of images created in response to her Barkindji family’s ancestral country in the desert of central western New South Wales. The Wandjuk Marika Memorial 3-D Award was awarded to Torres Strait Islander artist Alick Tipoti for his work Kaygasiw Usul (Shovel nose shark dust trail reflected in the heaven as the milky way), which tells the story about the tide always changing when the Kaygasiw Usul star constellation swings as if though it’s dancing with the Kisay (moon). The new Telstra Youth Category Award was awarded to Kieren Karritpul from Daly River, Northern Territory for his work Yerrgi which tells the story of his time growing up watching his mother, grandmother and aunties collecting yerrgi for weaving baskets and mats and uses acrylic on linen to illustrate this story. Now in its 31st year, the Telstra Art Award is the longest-running art award dedicated to the work of Aboriginal and Torres Strait Islander artists, and has come to be regarded as the premier national event on the Australian Indigenous art calendar. Artworks in this year’s exhibition are featured in an online gallery and on an interactive website, which offers users from around the world the opportunity to view moving images of this year’s artworks and listen to recordings of the stories behind the works that are available through a virtual online gallery. 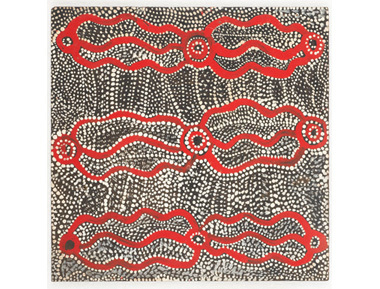 And in further exciting news announced today, the promised show of early Papunya boards - of which MAGNT holds the best collection in the world because its first Director was the only institutional buyer in the 1970s - has received generous philanthropic donations towards putting them on display at last. MAGNT heard earlier this week that it has secured a $125,000 grant from the Gordon Darling Foundation in Melbourne to support the research and production of its Papunya exhibition that is scheduled to open in 2017. This is on top of a private donation that was recently received in the amount of $85,000 from Geoff Hassall OAM to support a curatorial contract tied to this project. This means a total of $210,000 in contributions has been confirmed towards this important show, evidence that the newly indpendent MAGNT can raise funds from sources other than the NT Government. In March 2013, eight of the bark paintings went on display for the first time at the Araluen Arts Centre following the release of the Aboriginal Areas Protection Authority (AAPA) report which stated that 163 of the 226 paintings could be displayed without breaching any cultural sensitivity.